New Bus Drivers are required to attend an 8-hour training course. This training is usually given each month in various locations throught the state. There is no set schedule. Contact your local ROE for training near you. ​offered at either of our ROE #40 offices will be posted ​HERE. ​Or check out this web site for courses scheduled in the surrounding areas. May 1-2, 2019, from 5:30 - 9:30 pm. Parents can play a critical role in keeping their children safe by coaching them to use good safety practices when waiting for a bus and getting on or off the bus. Buses are engineered to keep children as safe as possible, with strict structural strength standards and designs that protect children in the event of a crash or rollover. But that protection is only available inside the bus, and most accidents occur when children are entering or exiting. 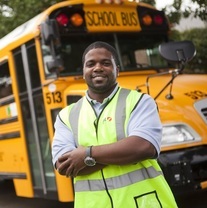 According to the Illinois State Board of Education, most children are injured because they hurry to get on or off the bus, act before they think or look, have little experience with traffic, assume motorists will see them and don't always stay within the bus driver's sight.